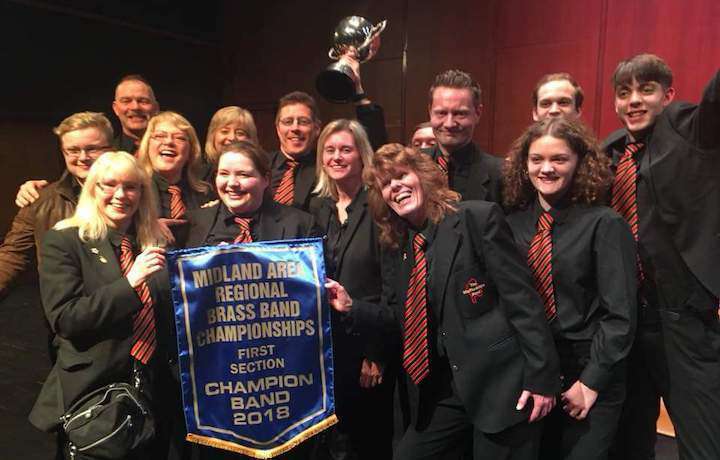 The Staffordshire Band are delighted to announce that a haul of new players have joined this successful, Midlands-based outfit, that came Runner Up at the First Section National Finals last September. Under its new Musical Director and hugely experienced bass player, Craig Williams, the Band over the past few weeks have welcomed back the wonderful Kris Davies on Eb Bass, a regular feature in the Band’s success over the years, together with another past player in the days of the Walsall Highgate Band, Lawrence Ecclestone has certainly made the most of his extraordinary talent with the likes of Desford and Ever Ready Bands, amongst others. Solo Trombone, Helen White is a product of the Royal Birmingham Conservatoire (albeit on French Horn), and now plays trombone with a variety of musical ensembles including brass and ska bands. Karina Fodden joins a now all-lady Trombone Section (with Helen Allen on 2ndTrombone) having spend the last few years at Oddfellows Brass. Lauren Gifford and Julie Dale, with Laura Jeffs, a student at the University of Birmingham, on Flugel Horn. On the Cornets, Gemma Leigh Price joins the Front Row from Sovereign Brass, together with Rachael Dickens, a former member of the City of Wolverhampton Band and the National Methodist Youth Band. Chris Wood comes in on Repiano Cornet from Sovereign Brass and Stephen Ward on 3rd Cornet.